It has been a crazy couple months. 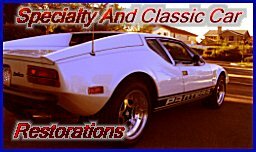 We built our display and held the tech session at the Pantera Owners Club of America Annual Fun Rally, and continued development on our new cable short shifter, and finally finished the dry sump oil system for the Pantera. To figure out the dry sump system, we had to first find a tank. We ended up going with the OEM tank out of the ZR1 Corvette. While it is a very nice tank, it was hard to find a location and a way to mount it because it is a very awkward shape with very few mounting locations. We fabricated a mount for the dry sump tank that mounts it upright on the passenger side of the engine. This allows us to use very short oil lines into the engine. Now we are finishing up the Oil Cooling/Filtering system that will be located on the driver’s side of the engine. Lot’s of fabrication work going on in the SACC shop. More updates to come shortly!